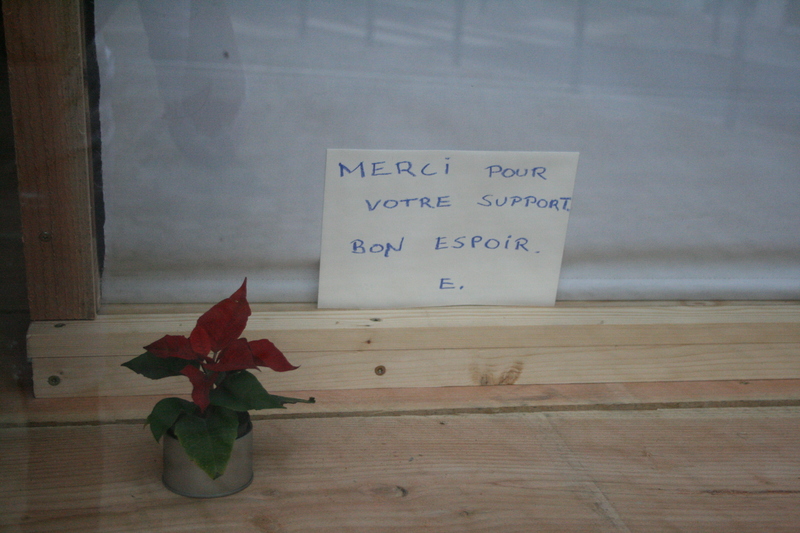 Bureau d’Espoir comes to an end today and we would like to thank you for your support. Tonight the researchers will come out of the Batteries after three weeks of experimentation to which you contributed as volunteers. From 19:00 we invite you to have a drink and the last Anorexic dinner with us. Bureau d’Espoir greatly appreciates your contributions and hopes to see you this evening!! Was thinking about that balance between resistance and surrender. Letting the other, the “alien” invade you. Dear, what a scary dream you had with me in a hospital bed with my ‘parents’. I have to confess that after imagining a guy shooting me I got a bit paranoid with your dream. As if we are in some premonitory mood. But, to avoid this paranoia i have been thinking a lot about your dream, my imaginary guy shooting me and the fact that we are leaving the battery tomorrow. Reflecting these scenarious helped me to not be ‘waiting’ for my killer yesterday night. i asked myself ‘what’ is being killed and ‘what’ is going to the hospital. (?) About the hospital I can’t say . . . It’s your dream . . . But about my imaginary killer it’s a lot about the ‘fear’ of going out, as if somethingneeds to be killed before I leave the box. Or something of myself in the outside needs (it is already) to be killed. Or even the anxiety that I made it until here and something might happen that doesn’t allow me to ‘go out’. I am here, inside and outside. I did dress up, I am not screaming or drinking beer. I am drinking tea. I decided to read a book during the transition of one year to the other. (…) This book is not for you to read but for you to be. And that’s exactly what happens when you read her. You are. You are what you are reading. You are pulled into the momentum of an instant, as if she can strech the speed of an instant which is ungraspable into a graspable instant of reality. (…) But what about the people dressed up, screaming, drinking, celebrating euphoric the relief of closing a year and he promisses and hopes for a bombastic new beginning. Why does it need to be bombastic? They are here again, knocking on my window. They are bombastically looking at me and I am curiously looking at them. They ask me when I will be free again and I answer, if “free” is being outside then in three days. They leave, I stay. (…) The world outside seems so conceptual. They walk, they come, they go, they enter the car, they drive the car, they smoke, they pass, they go, go and go somewhere. When we all agree that there is an end and a beginning, it becomes even more conceptual from here. (…) And I close my curtain. I can still hear them. I open the curtain and put my sleeping mask on. I love to look at them from behind the mask. It’s a nice perverse thing because they are looking at me but they don’t know that I am also looking at them. This way I can really see how they look at me. There is a kind of freedom in it. I had a wonderful new year’s night. I started by cutting my hair with this little pair of scissors, think I wanted to state the intention to let go off vanity in the next year, to let go off what I do not really need (like hairdressers), to make a start on the poverty practices. It felt really good, concrete and interesting. Not sure what it looks like though. Then I curled up with a book on Zen practice, and it was one of these moments when everything seems to make sense, and you really get some of these Zen riddles. And in the middle of all the chaos outside I felt so happy and calm. The battery really has become my home now. There is not really anything I miss from my house. But off course everything is taken care of. (…) I thought the battery would be a lot about overcoming boredom, but I haven’t been bored for a second, which is really weird since I get bored so easily. Or so I thought. I am a bit ecstatic today. I love it here. I love my life. I am probably going a bit airy again. It seems that every time you are leaving a place you start acknowledging again how much a place is important. I’m not going to deny that I am also looking forward to leave the box and go home, but at the same time I wish to carry with me as long as I can what I am learning here. I hope the transformation that is happening here gets printed on me and the frenetic outside doesn’t steal so fast the great and profound knowledge gained by the battery.